Eid Mubarak to all my friends. Hope you all enjoyed Eid well. I was planning to share this recipe of Chicken filled Caterpillar buns or stuffed Croissant in Ramadan, but I couldn’t share it with you. Anyway here it is. Try it at home and let me know your thoughts on it. In a bowl, add 1/4 cup of lukewarm water, dried yeast, 1 table spoon sugar and keep aside for 10 minutes. In a large bowl, add flour, milk, oil, 1 beaten egg, 2 table spoon sugar etc. and mix with a spoon. Add yeast-sugar mix in and knead well with hands. Add luke warm water to make the dough a bit pliable. Knead well to get a smooth structure. Make the dough like a big ball and cover the bowl with a damp towel. Let it rest for 4 hours to double the volume. Cook chicken with a little pepper powder and salt. Shred it and keep aside. In a non-stick pan, heat oil and add sliced onion and saute in medium flame until light brown in color. Add ginger garlic paste, chopped green chillies, curry leaves and salt. Saute for 2-3 minutes. Add shredded chicken, chopped capsicum and grated carrot to it and cook for at least 5 minutes. Add chopped coriander leaves and sprinkle garam masala. Mix well and switch the flame off. Let it cool. Now lets work with the dough again. Punch down the dough lightly using the palm and divide it equally. Clean and generously dust your workspace with flour. Roll out the dough into slightly think round shape and add the filling on one side and cover it to other side. Give some slits on the other side (Please refer the pictures) and fold the slits on the covered side just to look it like a caterpillar. Let it sit for another 10 minutes. Beat another egg in a small bowl and brush the buns slightly with a beaten egg. Sprinkle sesame seeds on top. Preheat the oven in 200 degree. Arrange butter paper on the baking pan and keep each buns on the paper leaving 2-3 centimeter distance. Bake the buns for 15-20 minutes or until the top portion is golden brown. You can use anything like veggie, chicken, cheesy, tuna, etc for the Croissant filling. 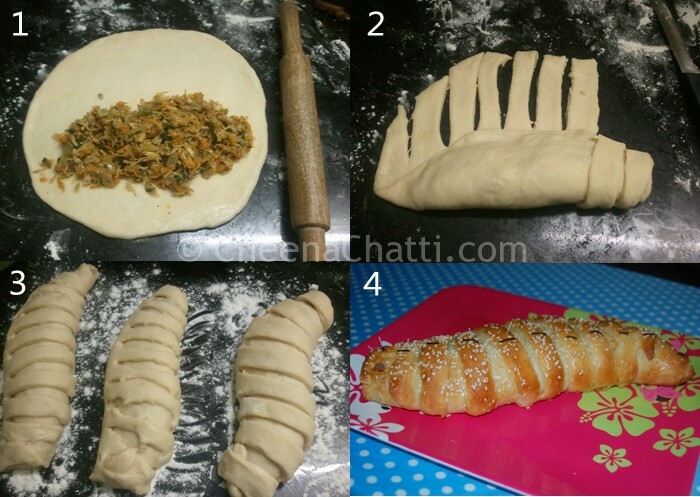 This entry was added on August 10th, 2013 by Athira Sooraj in Bakery and tagged with caterpillar cakes, snacks, evening snack, chicken, caterpillar bread, baking caterpillar bread. Last revised on March 29th, 2018. Awesome… I love stuffed breads. The various shapes that it can be folded in is like an icing on the cake..
You have not specified the quantity of milk in the ingredients section. I m in a fix ! I am in the middle of preparing it ! This is indeed a fool proof recipe. I added a wee bit of milk . The buns were soft and great to taste. Thanks Athira for sharing your recipe. Hi, isn’t this recipe from Fauzia’s kichen fun website? 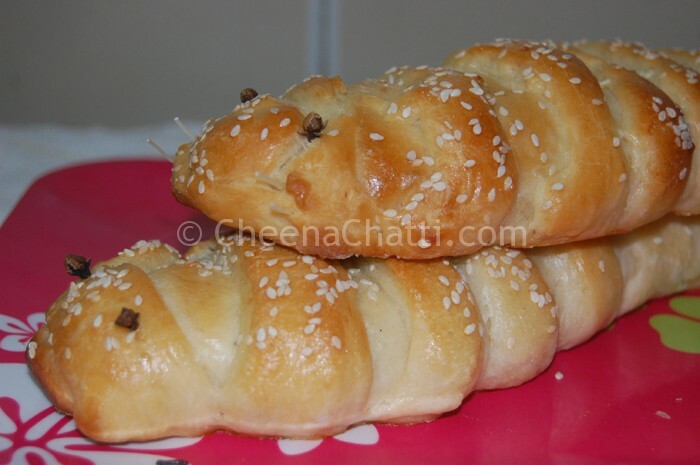 I see a few changes in the recipe but isn’t the recipe based on Fauzia’s caterpillar bread with chicken filling? in the ingrediens there is no milk writen but in the preparation there is..can know the quatity of milk..
@Munirah Abu Baker : as said in previous site comments – you can use either luke warm water or milk. or both half half. 1 cup water i have mentioned. Pl adjust the volume of it, until u get a pliable dough. i.e. half cup of lukewarm milk and half a cup of lukewarm water. awesome recipe.. I tried this and came out yummy :).. Thanks for sharing this wonderful recipe. Very nice! What is the recipie of Bun without Egg? Can you help me? I dont want to use egg. What is the replacement for egg?